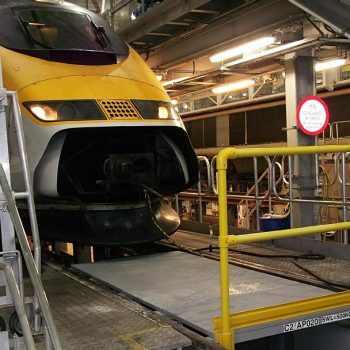 Safe access to rolling stock for maintenance can present practical difficulties where no existing platform surface is present, as can access of passengers to platforms where no provision for wheelchair users has been made in the past, or where existing steps are steep and hazardous. All platforms are bespoke made to specifications as requested by the client. Safe access by staff to rolling stock for maintenance can present practical difficulties where no existing platform surface is present; as can access of passengers to platforms where no provision for wheelchair users has been made in the past, or where existing steps are steep and hazardous. Highly effective solutions to these problems are custom built access platforms and ramps made from composite materials. The public, personnel & light equipment can utilise these new surfaces to gain easy and safe access to train carriages or locomotives in all circumstances. 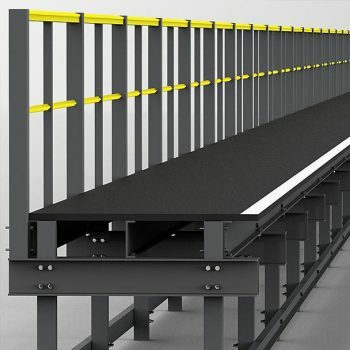 A full design, drawing and engineering verification service is available for these products, with prefabricated sections being delivered to site for rapid assembly by our installation team. All walking surfaces are finished with a highly durable, Anti-slip coating incorporating refined aluminium oxide grit. 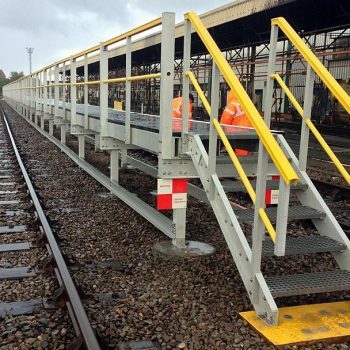 Integral guard rails are fitted, conforming to Equality Act legislation if required, with hazard edge markings, gated access, end of platform steps also available options. Glass Reinforced Polymer (GRP) products will not rust or rot, nor will they need painting as the colour is throughout the product and they are easy to clean too. Medium acquisition and low life-cycle costs are also significant. Should substantial damage ever occur to any components, modular construction allows for quick, easy & low-cost repairs.